This week: an opportunity to experience RDI, creating an inclusive education system, and planning for adult supports. Bang A Beat Family-Centred Therapies is VERY excited to now be offering RDI! Would you like to know more about what Relationship Development Intervention is, and if it’s a useful learning tool for your family? Sign up for “RDI 101.” It’s a 4-week seminar where you can see what it’s like to apply RDI to your family, including both in-class learning and strategies to try at home. Learn more and register here. Accessibility in Schools: Join the Discussion! Barrier Free Manitoba and Education Solutions Manitoba are working hard to keep everyone thinking and learning about inclusive education in Manitoba. If you haven’t yet, fill out their survey! 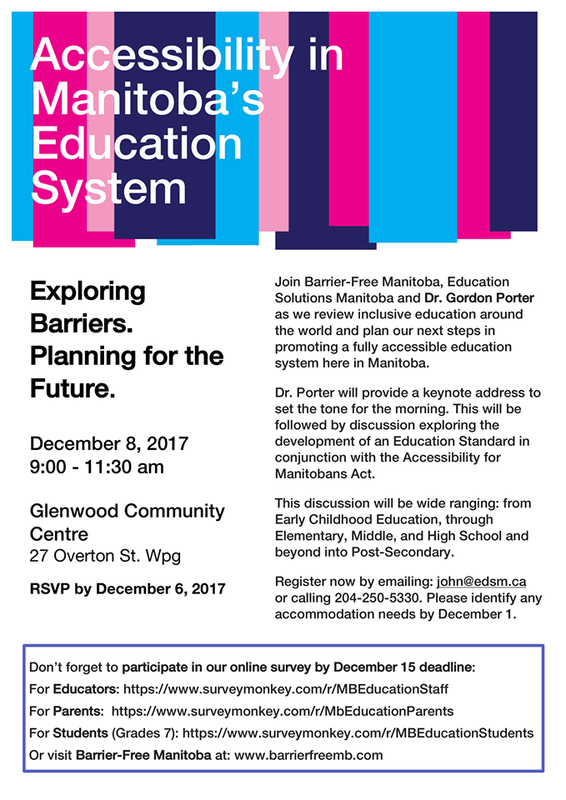 And also consider coming to this event with Gordon Porter, who has been working on issues in inclusive education for many years. Would you like to understand the support offered to adult Manitobans with autism? A presentation on Community Living disAbility Services is being offered by Continuity Care, Innovative Life Options and Inclusion Winnipeg. Topics include services offered, eligibility, and the referral process. Monday, December 4, 7-8:30 pm. Participating by teleconference is an option. Register by emailing admin@inclusionwinnipeg.org or call (204) 786-1414.